Burlington Northern Santa Fe 2263, Blaine Washington, July 2009. My sister captured an interesting play of lighting as BNSF 2263 rumbles past her front deck on Drayton Harbor. Back lighting cast by the late afternoon sun is countered by the sunlight reflecting off my sister’s living room windows casting harsh lighting on the side of the machine room. And believe me, our telephone conversations are drowned out whenever a train rumbles by. Especially southbound, having just cleared the US Port of Entry, with throttles just getting up to “run 8,” rattling her china cabinet! My sister obviously has a great vantage point for capturing BNSF power. But fortunately for her, I never acquired "a taste" for the mega-railroad, preferring to remember this as the Great Northern Railway. Great Northern built this line from British Columbia connecting to Everett and south into Seattle. The long standing Great Northern Station in Blaine has become the focus of residents of Blaine to salvage the Station, as I wrote about earlier this year. Recently, a second Amtrak “Cascades” train service has been added between Seattle and Vancouver, gearing up for anticipated patronage during the Vancouver Winter Olympics. I encourage you to read the comments at the bottom of this link for interesting remarks on how customs screen train passengers. Speaking of customs, here is an interesting article describing the history of the US/Canadian Customs stations from “the beginning.” Included is a detailed explanation of how customs inspected the Great Northern trains at Douglas. Railroad Stuff: BNSF 2263, built as St. Louis – San Francisco 408, GP38-2, 2,000 horsepower 16V-645E, Electro Motive Division June 1973, serial number 73606-9. 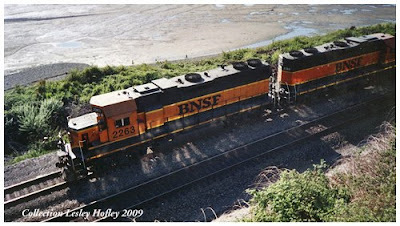 Became BN 2263 in December 1980, then BNSF 2263 in February 2000. I personally like backlighting. Like anything else, there's good and bad. This one is good. Actually better than good. The long shadows and kind of cool. I'm familiar with the area, and know that if you don't embrace backlighting in some form that you'll only take a mere fraction of the available shots.